Slipcovers For Recliners | Best 10 Pet, Waterproof & Ottoman Protectors! You just spent your hard earned money on a brand new recliner and you get home to find that your recliner is not how you left it! Whether it is kids with their marker colors, dog prints or food spilling, your furniture and décor needs protectors. In order to protect your furniture, you need to choose the correct slipcovers for all your furniture, including: chairs, couches, sofas, loveseats and of course, recliners. This is especially true for any recliners for kids, as well as any luxury recliners. By protecting your chair you will ensure that your upholstery looks new for years to come. When it comes to picking your slipcover, you want something that will complement your furniture. Hence, you want a wide selection to choose from and high quality choices. Aside from the apperance of your slipcover, you want the fit and stretch of the cover to be great. There is no point in buying a cover that will end up tearing because of intense friction. Covers should be made from stretchable fabrics and should not require continuous tucking or slipping. This will give your recliner and other furniture a clean, crisp and solid look. The Sofa Shield protector is one of the most popular recliner covers. It is an accomplished #1 seller and we loved its appearance and comfort. However, it is recommended for oversized recliners. Check out its best features below! 3) Make sure that the length of the modifiable strap is appropriate for your furniture. The loops of the strap should approximately fall around 4’ to 8’ from the very top of the recliner. Although the protector is recommended for oversized recliners, it comes in different sizes for other pieces of furniture. Sofa Shield offers the seat cover for chairs, futons, loveseats and sofas. Furthermore, the reversible feature allows you to double your usage and get a two for one. 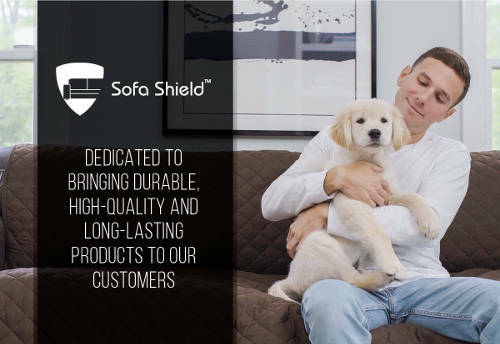 Sofa Shield protectors provide the best protection against everyday dirt, food, any type of pet hair and it's great for any accidents with your babies nursery recliner. Lastly, price! This cover provides excellent protection, and it will not hurt your budget at all. In regards to the price/quality spectrum, you get your money's worth. Note: Although Sofa Shield says that the cover is machine washable, they indicate that the strap should always be hand washed. Unfortunately, this is cover isn’t waterproof. It can protect your recliner from small drips and drops, but spills will get through. Next, is the anti-slip grip protector by Furniture Fresh. This is another popular cover that focuses on creating a firm grip on furniture in order to limit slipping. This protector also comes in different sizes in order to protect loveseats, sofas and extra large sofas. The most consistent slipcover complaint is that they continuously fall off of recliners and chairs. So, Furniture Fresh created and patented advanced anti-slip technology that includes increased grip and backing. It includes the introduction of Stay-Put Straps, which are designed to increase friction and hold the protector firmly in position. The most appealing part of this slipcover is that it includes the extra friction that prevents the slipcover from moving around. This is important because the constant re-adjusting of the cover can have an impact on the upholstery. By having extreme grip, that works from the back to the front portion of the recliner, you will be sure that your chair is protected thoroughly. The second feature that we love about this recliner is the extra fabric that is added in order to additionally protect vulnerable portions of the chair. The extra fabric that is added in the back increases the weight in the seating area to increase protection. Finally, the size of the cover. The 3 straps and metal hooks are created to cross below and reduce overall movement. This means that your dog can lay on the slipcover and you won't have to worry about any accidents. We found the material to be thin. The good news is that it wasn't an issue when we tested it, and customers have reported that it does not rip. Slipcovers tend to struggle with different sized chairs. However, this cover adjusts whether it is a sofa or chair. It can stretch out further compared to regular slipcovers and it comes in different colors. Also, covers are available for sofas, loveseats and recliners with different dimensions. All slipcovers are machine washable. The reversible feature provides two solid colors that can be used to match other decor and the room theme. Lastly, the quilted texture provides a warm feeling. This allows the soft suede to effortlessly complement the overall design. Although this slipcover is not waterproof, customers state it can take a small spill. This is impressive as slipcovers that don’t cover the entire recliner aren't capable of this. Although this cover adjusts to sizes, customers have reported that sometimes it tends to slip off. Therefore, we don;t recommend this slipcover for leather recliners. Unlike the previous 3 covers we have looked at, this slipcover cover is waterproof. This is great for chairs that stain easily and for protection against kids. Furthermore, it is 100% polyester which ensures that it will not rip or tear. The best thing about this slipcover is its ability to protect you from any disaster. This is a result of waterproof protection and protection from scratches, fur and stains. Additionally, this cover is skid resistant, meaning that you will not have to worry about damage. Overall, it is one of the best for complete protection. If you are worried that your brand name recliner could get ripped, stained, scratched or have hair everywhere, then this is the cover for you. The one complain customers have about this slipcover is that it tends to move around a bit. The Maytex Stretch Recliner Slipcover is one of the easiest slipcovers to apply and provides practical benefits. One of the main benefits comes from the elastic corners that result in better fit. Also, customers have reported that unlike other slipcovers, the Maytex cover doesn't have any issues with over-sized recliners. The feature that we love the most is the 4-piece construction of the slipcover. This differs from the traditional one-piece, but it provides a ton of variety. Combined with extreme stretch, this slipcover makes for the perfect adjustable cover for any chair, especially smaller recliners. This cover doesn't play well with larger chairs. You constantly need to keep tucking in the covers, big and tall recliner owners be aware! The Maytex Torie slipcover comes in beautiful tan and chocolate colors. It also comes with extra stretch elastic corners and premium fabric. Made from 3% spandex & 97% polyester, this cover can compete with the best. Along with the versatility, the stretch fabric comes with pockets to store electronic devices, books, remotes and anything else. Customers are especially excited about its ability to easily and perfectly tuck in. The ease of cleaning this cover and the lasting material keeps it feeling super soft. Bonus: Customers have stated that the fit of this slipcover is versatile in design and comfort. This allows it to cover small, mid and large recliners. We have found very little that could be improved. However, with all covers, there needs to be a bit of tucking in. In comparison to other covers, the Golden Linens cover leaves your chair with a clean and line-free look. This bodes well for those with contemporary homes and modern designs. The Golden Lines slipcover is one of the best "price for product" covers. The quality you receive is normally priced significantly higher. Our favorite part about this cover is that it is especially useful for motorized/power recliners, which are harder to find covers for. Finally, we loved the wrinkle resistance which made the cover appear as good as it does. One of the downsides is that it cannot be bleached or ironed. The last thing you want is to buy a cover and find out it doesn't fit. The first feature of your potential cover/protector that you need to analyze is the dimensions. By determining the size of the covers you can quickly eliminate the protector or keep it in contention. Most slipcovers will provide measuring guides while you shop; this is a great precaution to determine the target fit for your recliner. The second thing that you need to analyze is if the cover is designed for your recliners material. Some slipcovers do not recommend themselves for leather recliners. This is because of style, fit and movement. Leather recliners have more slip to them and this can cause certain covers to move around and become ineffective. If you have purchased covers for your sofa or couch you know that this can be a real issue. Next, you need to look at the aesthetics of the cover. Does it match with the furniture you have? Will it stand out? Does it complement the room? If you have bought a recliner based on how it looks, does the cover change that? These are the type of questions that will help you decide whether or not you love the way the cover looks. Finally, the slipcovers you are looking at should be water repellent and machine washable. If you have spills and accidents on your protector then you will want to be able to wash it. However, if it is not machine-washable then it will be extremely difficult to clean. Eventually it will start to smell and release an unpleasant odor in the air. Through our review, we tried to target the best slipcovers available. By looking at stretch, cover, styles and price, we were able to quickly narrow our search. The most important features for any cover comes down to the stretch and fit. Whether it is for your recliner or couch, you need adequate protection from everyday attacks.